I have been using the iDevices iGrill Mini for almost a year now and decided to write a review about my experiences with it so far. In this iGrill Mini Review, I will discuss how well it works, how durable it is, some minor drawbacks with it, and where to get the best deal when you buy it online. By the end of this review, you should have a good idea as to whether the iDevices iGrill Mini remote meat thermometer is right for you. I remember noticing right away after opening the box how small and lightweight the iGrill Mini was. At just 2 inches by 2 inches, it is definitely on the diminutive side. Don’t let the small size fool you, though. This device can still do many of the things the more expensive options can do. The next thing I noticed was its simplistic, yet sleek and modern design. It’s a sharp looking grilling accessory that packs a lot of useful options into its compact frame. It has a semi-glossy black finish on top outlined by a silver, sturdy plastic. The body is red plastic and has a jack on the front for attaching the probe. It snaps on quite snugly to a sloped rubber base and can be rotated depending on if the device is sitting flat horizontal. The base has a magnet built into it for attaching to any metal surface of your grill. This makes it very convenient. If your grill or oven is not made of metal, it also comes with a small circular magnet with adhesive on one side. That way, you can stick the adhesive magnet to any surface and then attach your iGrill Mini to it. The probe has a colored insulated rubber grip for safer handling when it is hot. Finally, it comes with a probe wrap that makes storing the 48-inch heat resistant cable easy to do. The manufacturer claims that the device allegedly has up to a 150’ Bluetooth Smart Range and a 150-hour battery life. It also claims it has a heat range of -22°F up to 572°F. You must first download the free “Weber iGrill” Connected app onto your smartphone. There is an on/off sensor in the middle on the top of the device that is circled by LED lights. Push down on the button and the LEDs will flash white to let you know it’s on. After that, the lights will flash blue letting you know that it’s ready to be paired with your smartphone. Open the app and select “Connect My Product”. Supposedly it is very easy to pair the iDevices iGrill Mini to your smartphone. Once paired, the LED will flash green. The app has several preset temperatures you can choose depending on what you are cooking. The app will let you select between a Fahrenheit or Celsius readout. It will also let you select different alarm sounds and a courtesy warning when your meat is 5°, 10° or more from being done. Select the “Set Up Cook” option and you will see choices for different types of beef, poultry, pork, fish, and lamb. Many presets have the option to select settings to cook your meat to rare, medium rare, medium, medium-well and well done taking the guesswork out of your foods doneness. You can also create custom temperature presets that can be saved and used later. There are also options to set up a custom probe name and probe color if you are using more than one probe. The app comes with the ability to share what you are cooking by posting on the social media site of your choice. It allows you to send emails and texts right inside of the app. There is also a section for recipes. It’s now ready to be inserted into the meat and to start cooking. The LED will turn a solid green letting you know it has started measuring your temperature. When your food is within 15° of the pre-set, the LED will turn yellow. At 5° of the pre-set, it will turn orange. When it reaches the desired temp, the LED will flash red and it will then send out an alert to your phone. I was able to pair the device to my smartphone quickly without any problems by following the on-screen prompts. Navigating through the menu was easy and not overly complicated. While the manufacturer claims that it has a range of 150 feet, I have found that it can sometimes be a little iffy when there is too much interference between you and the grill. This is the case for most Bluetooth devices, though. I have been able to head to the kitchen or family room without any problems for the most part. I have never actually timed the 150-hour battery life that the manufacturer claims, but from my experience, the battery life has been very good for such a small device. The battery is also easy to change when needed. When the iGrill Mini first came out, I remember reading a lot of complaints online that the body would come out of the base too easily when sitting horizontally. This has since been addressed by the manufacturer by a slight redesign and I have never had that problem personally. I learned the hard way that if you go higher than the suggested heat range of 572°F, you can damage the probe causing it to read incorrect temperatures and it will need to be replaced. Watch out for big flare ups. The iGrill Mini replacement probe is around $17.00 so you will want to be careful with them. 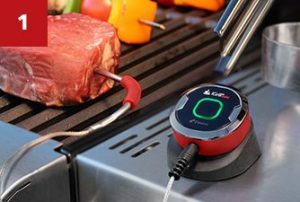 The iGrill Mini probe is easy to clean. Just use a wet soapy sponge on the part that was inserted into the meat. Never submerge them in water or put them in the dishwasher. If you get the attached insulated wire wet, it can damage the probe and cause them to read the wrong temperature. Again, I learned this the hard way. The second time my probe started reading the incorrect temperature, I contacted the manufacturer and they replaced it for free. That was nice. I have not had a problem since. I’ve found that the temperature readings have been pretty spot on. I tested it by inserting an instant-read thermometer into the meat and it was almost an exact match every time. The iGrill Mini currently has a 4-star rating out of 5 on Amazon. “This is what I’ve been missing “. “I love it. easy to use”. “We use this all the time. I love this thermometer!”. It is hard to know when the device is actually turned off and it completely drained the battery. The meat probe is not waterproof and can be damaged easily if it reaches temperatures higher than recommended. Simplistic, yet sleek and modern design. Navigating through the menu was easy and not overly complicated. It is easy to forget to turn the device off causing the battery to drain. The meat probe can easily be damaged if used or handled incorrectly. It can only monitor one piece of meat at a time. Should You Buy An iGrill Mini? What you get for the price is impressive. You no longer have to babysit your food giving you the freedom to enjoy other things. If you add in the fact that your meat will be cooked to the precisely right temperature makes this a no brainer. I have personally been using the iGrill Mini for about a year now and I can honestly say, the end results have been much better. I will never cook larger cuts of meat again without using a meat probe if I can help it. This small investment will really take all the guesswork out grilling and your guests will notice it. In my opinion, with a little care and caution, this device can make your next cookout a winner. You won’t want to ever grill without it. ship for free. They also offer same day shipping if you want it right away. Amazon is also one of the most reliable companies when it comes to purchases. 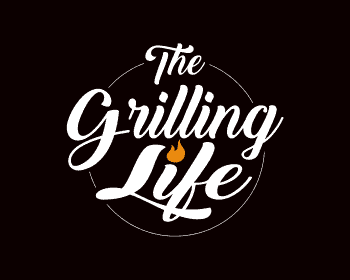 If you have any questions about the iGrill Mini or want to leave your own personal review, leave a comment below. I hoped you enjoyed this review and you are one step closer to joining me in “The Grilling Life”! Okay, this is sweet! Didn’t even know they had products on the market like this. I will be showing this article to my dad. It seems as though the last few times we have cooked burgers on the grill they have been overcooked and burnt cause my dad always goes back inside the house to do other things and always forgets about them. Even if we have the timer inside on sometimes other family members will go and shut it off after it starts beeping not knowing what it’s for. My dad buys really nice burgers from a local meat market and is always so bummed when they get over cooked. Thanks for the great review and helpful information! I have done that exact same thing more times than I can count Brianna so your dad shouldn’t feel too badly. There is always so much to do and it is super easy to get distracted. I can honestly say though that since I starting using the iGrill mini about a year ago, it has been like night and day. My cookouts almost always come out perfectly now and my family and friends are thankful I found this device :). I’m glad this article has been useful and I wish your dad great success on his next BBQ! Don’t forget to check back in from time to time as I am always on the lookout for helpful tips or stories I can share. Happy Grilling! This is definitely a must get for when I finally move out and need to cook on my own! I have to write this down on my list as I have always been worried about cooking meat as I can never tell when it is done! Actually, my mum got me to cook sausages once and I got a mouthful of raw meat! Ew! That was an experience I never want to repeat! Thanks Emma. It is a great gadget to have and I highly recommend it. As always, I appreciate you stopping by. Don’t forget to check back in from time to time as I am always on the lookout for helpful tips or stories I can share. Happy Grilling! This looks like the kind of gadget that will get me to clean down the barbecue I haven’t used for two summers! At the moment I only use a very worn out George Foreman grill. Don’t wait Stan. Get that barbecue down and get to cooking. The iGrill Mini will make you the hit of the neighborhood! Thanks again for the support. Don’t forget to check back for more new tips. This thing looks crazy! Have there been any issues with having the BBQ lid closed and pinching the cord? Im also curious to whether or not the entire cord is safe in such extreme heat. It is crazy, crazy good Stan. The cord is flexible and cinch proof and I have never experienced nor seen any reported issues with it being damaged due to being pinched by the BBQ lid. It is made to withstand heat up to to 572° F (300°C). So as long as you keep that in mind while grilling and wait until after you sear both sides of your meat before inserting it, you will be fine. Don’t forget to check back in from time to time as I am always on the lookout for helpful tips or stories I can share. Happy Grilling! Ok….here we go… a grill with an app. Now, that’s a take two incredible. No wonder the name iGrill iDevices. This is simply how I want to grill my beef and meals while I make my friends grin with envy as I share it on my facebook page. Thanks Patrick, I never knew something like this existed and I will be making a purchase soon. Great day. Haha Koko, I couldn’t have said it better. I can’t wait to see your Facebook posts with all the great food you are making. And I will be grinning right along with your friends! I appreciate the support and great comment. Don’t forget to check back in from time to time as I am always on the lookout for helpful tips or stories I can share. Happy Grilling! This product sounds great. I like hoe it syncs up with your phone and has programed temps depending on what you are cooking. I never know when meat is done, other than if it is no longer bleeding. The fact that it gives you an idea of what temp to cook it at is very handy. Too bad you can’t use it on more that one piece of meat at a time, but either way, sounds like a good product. It has made a difference in my cooking definitely and the convenience it provides is awesome. Don’t forget to check back in from time to time as I am always on the lookout for helpful tips or stories I can share. Happy Grilling!